Last year, I visited St Patrick's Event for the first time. It is a lot different compared to decoration this year. Happy to see Belinda Chee as the emcee also. 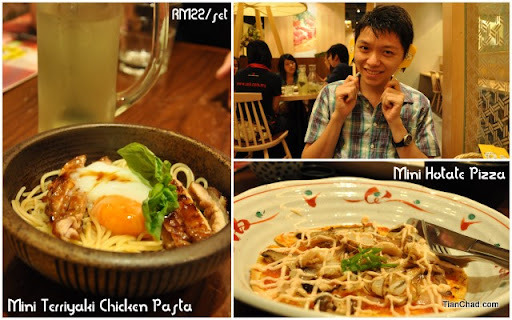 While waiting for friends me and Wern went to have dinner at Pasta Zanmai [1 Utama] first. 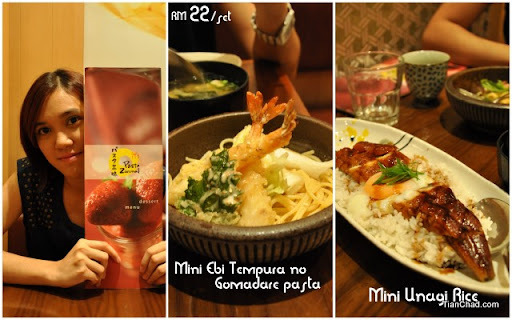 First time try their set menu. While searching for the redemption center we witness the green-themed fireworks. Really nice as it just happen above my head. I got the fireworks show recorded down but I can't upload it until I get Streamyx at home. Haha, didn't know Audrey was the one to help us redeem the Guinness pint. Sorry for being late! Aundrey, her friend and HuaiBin! There are ladies who dressed up for the event too. Each of them have different props~! We start to play game as it is free and we can win the St. Patrick's Magnet. This one is to bounce the frog to land at the right spot. I like to see happy face, don't you feel the same? That one is the most easy winning game. There is a dice game going around and you need to get specific number to win. The event would be better if it wasn't rain that night. I would choose an open air seat to enjoy the comedian show. They are so updated cos they joked about "bromance". Have a good laugh will makes your stress fly away. However, it is good to see the event getting better and larger every year. It is good to have a DSLR, cos it helps you spot the belle + Nikon D700!! 3. Vote for our Video entitled "The amazing Disgrace" and "The Gaga Story of Me"
4. Congratz to you as you've just accumulated some good karma~! Goodluck for the lucky draw!